While Gauteng is known for temperature extremes from summer heat waves and freezing winters, KZN is notorious for its hot and humid climate and mild winters. In these climates, maintaining temperatures in refrigeration and cold storage environments can be challenging. Product spoilage caused by large temperature variations can be extremely costly for end-users. The sustainable control of the interior climate of cold storage/refrigerated areas is therefore imperative and there simply can be no compromise. “Long-standing Maxiflex customer, Insulated Structures, placed the orders with us because they are satisfied with the quality of our products and service delivery,” adds Janssen. The high-speed doors incorporate the latest and most advanced control and safety systems to deliver reliable interior climate control, increased energy savings and improved productivity. For end users this translates to lowest total cost of ownership and a greater return on investment. Featuring modern drive technology and MCS frequency converter controls, the doors can open and close at speeds of up to 2,4 m/s. These high operating speeds combined with higher cycles (>100/hour) and excellent sealing capabilities allow for efficient traffic flow, minimise temperature variations and maximise energy savings. The doors must be installed in conjunction with an insulated ‘night door’ in order to maintain the extreme cold temperatures during periods where there is minimal or no traffic and can be set on a timer to open automatically to minimise ice build-up on the curtain and side-guides and keep the door functioning properly. Additionally, heating cables in the side columns and motor also prevent formation of ice. During the design of the high-speed doors, Assa Abloy paid attention to worker safety and reduced downtime and has incorporated ‘intelligent’ features into the doors. Designed with a soft bottom edge with no rigid parts, the doors are able to mould around any obstruction to prevent injury or damage. Moreover, when an object hits the door, the fabric curtain absorbs the impact and releases itself from its side-guides without causing damage or being damaged itself. The door can be equipped with different sized windows or full door width vision panels to increase admission of natural light and visibility to create a more comfortable working environment. Another intelligent feature of these long- life-cycle doors is the break-away and automatic repair system; the curtain reintroduces itself after a crash to reduce downtime and maintenance. In addition, a zip closure system and a flexible, automatic curtain eliminate the risk of work stoppages and minor collisions. • A unique direct door drive system actively drives the door curtain which saves costs by eliminating the need for weighted bottom bars or tension systems. • The robust steel IP54 control box is easy to program and operate with a clear display giving a wide range of information. • The galvanised steel construction ensures rugged reliability (stainless steel option also available). • The compact footprint and slim side frames allow fitment even in tight spaces. • Fast and easy assembly. 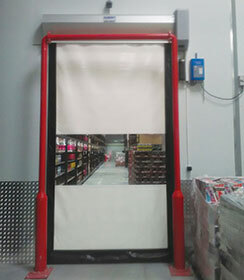 Designed for both small and large openings, the high-speed doors are suited to a wide range of industries offering specific solutions for applications such as hygienic food and pharmaceuticals manufacturing, machine guarding and protection operations. Maxiflex’s KZN and Johannesburg teams were responsible for installing the two high-speed doors at each of the Makro stores.